This, dear readers, took some doing. After several months of on and off trial and error, I ended up with two versions, neither of which was really satisfactory, to my standards. So there they languished, in the draft post. Until one evening, when I opened the post back up, scrapped both those recipes, and came up with the one you find here. I was especially driven to finish the post because, after tweeting about the difficulties of finding a hot poker, a package arrived in the mail from Andrew Cairns at Willowdale Forge with two such accessories. Finding myself thus enabled, how could I not follow through? The thick sugary syrup sticks to one’s lips and tongue, the concentrated ginger burning pleasantly. I tried several versions of a ginger oil, but they were, at best, completely unappetizing. Hence, the ginger syrup swap, the texture of which, I think, closely mirrors how a ginger oil would behave on the palate. I hemmed and hawed over the pear brandy. It’s described in the book as being “milky”, but I’ve never seen such a creature. I did a few experiments to see if I could come up with a way to milkify my pear brandy, but the end results were not worth the effort, and moreover, detracted from the cocktail as a whole. The last ingredient was also somewhat troublesome. It seems to me that it cannot be both a liquor and a cooking wine. Given the cocktail nature of the beast, I opted for liquor. Mind you, I also tried a radish-infused white wine (BLECH! ), but it left a great deal to be desired. Instead, I’ve decided to go for vodka: it’s clear, and made from roots (potatoes). If you like, you can infuse the vodka with some sliced radish, but trust me when I say to go sparingly. Pretty much, let the vodka look at a radish, and that will be enough (or possibly too much…). 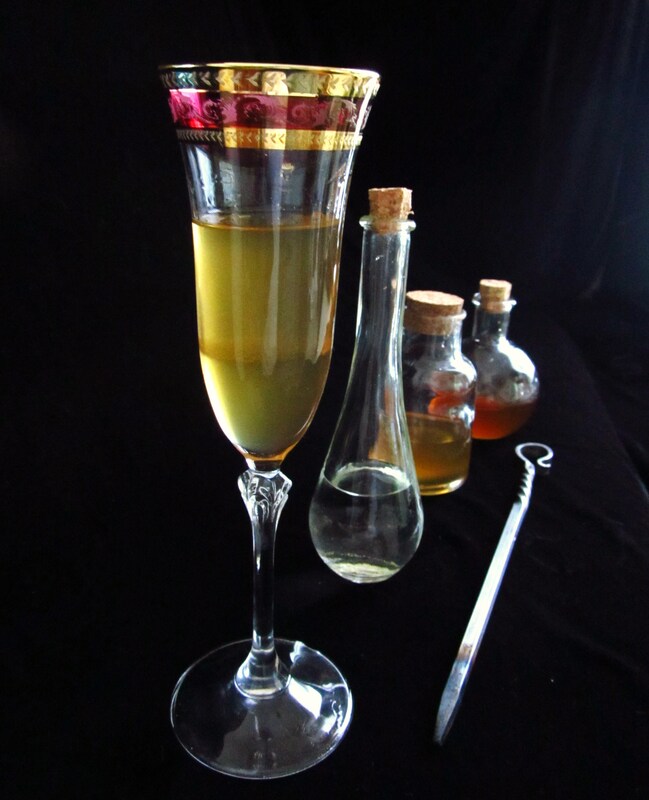 The end result is a decadent, ethereal cocktail that will knock your socks off. If you’ve scalded it, the cocktail will still be warm from the poker, and that physical heat transitions into the burning flavor of the ginger. Adding to that theme is the slight tone of burned sugar, while the pear flavor is much complimented by the ginger, and the vodka gives it an extra boost of intoxication. It was described by my tastetesters as “exquisite”, “otherworldly”, “exotic”, and “amazeballs”. All in all, it’s just complex enough to be special, without being impossible to make. 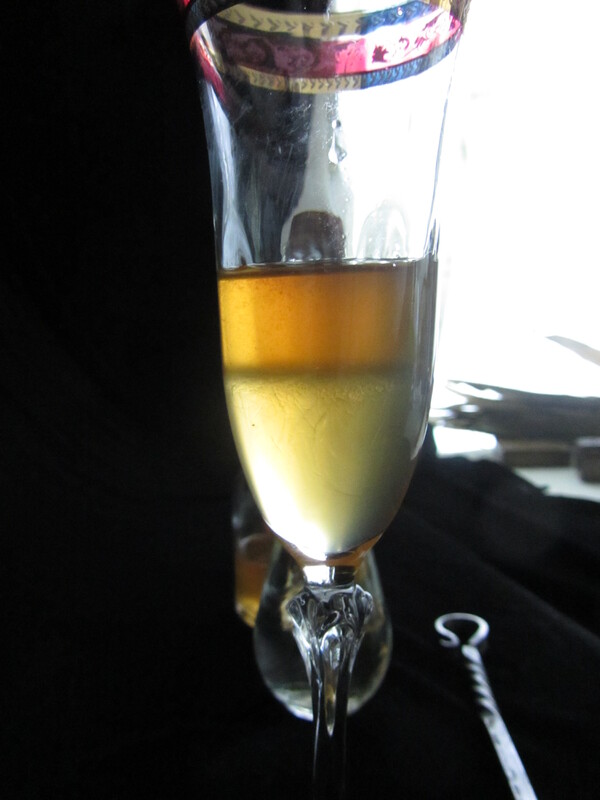 Into a champagne flute, pour about two fingers worth of ginger syrup. Follow this with a good splash of pear brandy, then a finger or so of vodka. Stir the mixture vigorously to get the sugar up from the bottom; you’ll be able to see it swirl around as you stir. The top photo settled while I was shooting: Do as I say, not as I do! Once it’s mixed, you can sear it with the hot poker. See the note at the bottom on the crazy danger of hot pokers. That bottom layer is the ginger syrup, which, if planning to sear, needs to be incorporated with the rest of the drink in order to be close enough to the hot poker. Get to stirring! Combine ingredients in a saucepan, and place over medium heat. Allow to simmer for about an hour, at which point much of the liquid should have boiled off, and the remainder be a nice cinnamon sort of color. Let the mixture cool (nobody likes sugary burns! ), then strain into a glass jar. It will keep for several weeks, and makes enough for around 10-12 cocktails. I am profoundly embarrassed by the wet cloth mistake. When that scene was written I had not yet been through firefighter training and my knowledge of thermal properties would appear to have been craptastic! So you hadn’t a real world thing in mind when writing the passage? This looks lovely. I want to try it. I’m so glad you stuck to it….the final recipe looks very appealing. I adore ginger. This looks brilliant! and do-able! thank you! I’ve got one of those tubes of “freshly chopped ginger” in the fridge, can I use that to make the syup, or do you think that wouldn’t be fresh enough? This could probably be used as a cold remedy as well, as Vodka kills just about everything, and ginger is good for when your stomach feels yucky. A good fresh ginger trick, by the way–store it in the freezer and grate it on a microplane. It grates more finely, and stays fresh for months. Yep, never thought I’d hear that one!